In 1998 Marcus came back from some month travelling in Asia! He went to visit his good friend Magnus, who just had started his sound enginering education. Together they formed the band HOLIDAY WITH MAGGIE. With a mixture of Magnus girl problems and Marcus travelling they had some great popsongs. At the end of the year 2000 Snowglobe Records got in touch with HOLIDAY WITH MAGGIE. They really liked what they had heard and wanted to release a mini-cd as soon as possible. And in the middle of 2001 "Librarian types" was released; a six-songs mini-cd with both old and new songs. It got some really good reviews and also many airplays on the American collage radiostations. After the release the new members Alec Ahlenius, Joel Edin and Anders Björk joined the HOLIDAY WITH MAGGIE family. They played some kicking shows this year with Soundtrack Of Our Lives and Swinging Blue Jeans among others. The Japanese label Syft Records digged "Librarian types" and said that they wanted to release it in Japan on both CD and LP. So a licence agreement was made between Snowglobe Records and Syft Records and in February 2002 Syft's sublabel Boundless Records released "Librarian types" in Japan with the bonus track "Me & Baggio" included exclusive for Japan. "Me & Baggio" was actually the first HOLIDAY WITH MAGGIE song and the first recording as well. This release resulted in a contract beetween Boundless Records and HOLIDAY WITH MAGGIE. Boundless Records was eager to release the debut album, so the work on it started right away and "Nice from far... but far from nice" was finished in the summerbreak of 2002. The theme for the album is without doubts girls and a little bit travel. The sound is more heavy and punchy than the mini-cd and a big difference is of course that it's a complete band now. All song are written by Magnus and Marcus. The album was recorded and produced by the singer Magnus at the Overlook Studio, Gävle. Before the release of the debut album a 7" single was released with the songs "King of the suburb" from "Nice from far... but far from nice" and the b-side "Tove, Jenni, Elin and Lotta" exclusive for this limited 7" single. So, after much hard work and many fights in the studio "Nice from far.. but far from nice" finally was released on the 18th of Januari 2003 in Japan by Boundless Records. The album got really good response in and sold very well. Magnus and Marcus released a single and later on a fullength album with their other band MONASTIR in Sweden and it got great response from the national radio and MONASTIR went out on the road in Scandinavia and later on a Japan tour. This became a natural paus for HOLIDAY WITH MAGGIE. But, many new songs were written and captured on portas and pocketmemories. After a roadtrip in USA, the work on the new album started. First a four songs promo, sent out to a bunch of swedish recordlabels, which resulted in a contract with the swedish label A West Side Fabrication. 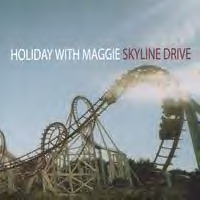 HOLIDAY WITH MAGGIE started to record the new album "Skyline Drive" in a couple of studios around their hometown Gävle in January 2004. Now, the line-up was changed. Joel and Anders were not in the band anymore. But, during the recording Magnus and Marcus played the bass and the keyboard beautifully! The new songs were a little bit different from the last album. More dynamic and intense, but in the same way more emotional and sinsere. Magnus Björk / vocals and guitar.